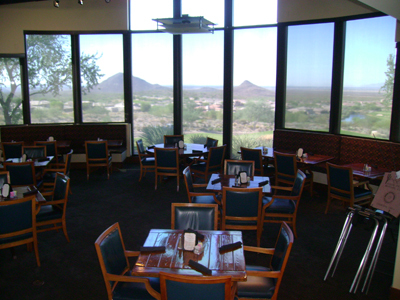 Framed by panoramic views of the southeast Valley of the Sun that seem to stretch as far as the eye can see, guests of The Grille at Eagle Mountain are treated to one of the most picturesque vistas in Scottsdale as they dine in this comfortable, full-service eatery. From dawn to dusk, the friendly and professional staff serves up a delicious selection of breakfast, lunch, snacks and beverages every day. Chef Brittany's creative culinary talents appeal to wide variety of palates. Her menu, loaded with all-American favorites with a Southwestern spin, provides guests with the coveted combination of quality and variety. 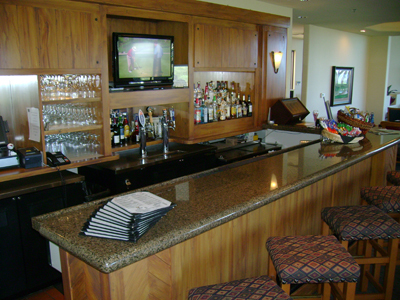 Open daily for breakfast, lunch and late afternoon appetizers, the Grille at Eagle Mountain also offers Border Disorder, a weekly all-you-can-eat buffet hosted every Wednesday from 4:30 pm to 7:30 pm. Check out the next Border Disorder Wednesday menu on Eagle Mountain’s event calendar. Unless otherwise noted, reservations are not required at the Grille.